Renting an instrument from Beacock Music is easy! We offer a month-to-month rental program with 100% of monies applying to the purchase of an instrument (first twelve months of rental contract only). You have the option to return or exchange your instrument at anytime at no extra charge. 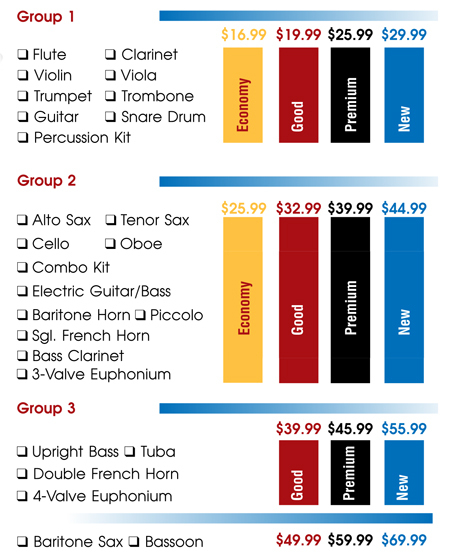 Rent online and have your instrument delivered to the school, or pick it up in the store! ■ Complete School Service Division making exchanges, repairs, and returns painless! All instruments are guaranteed school approved instruments and are in excellent working condition. Economy, Good, and Premium instruments have been previously rented, processed by our technicians, sterilized and their rates reduced. New instruments have never been rented or sold before. We are family owned since 1976. Beacock Music is a progressive company committed to helping Make Music Happen. Beacock Music features a complete selection of name brand band and orchestra instruments, and an extensive print music department stocked with your favorite band methods and arrangements. Beacock Music has the resources to help you and your students succeed in music. We’re out on the road visiting schools EVERY DAY, bringing our services to you to MAKE MUSIC HAPPEN! Contact us to arrange a weekly visit to YOUR school. Apply on-line and we’ll deliver your instrument right to your school – no extra charge! For your peace of mind, we offer "Repair and Replacement" coverage for rented instruments. A nominal monthly fee will protect you from loss and damage due to theft, fire, and vandalism. From time to time, your instrument may need some adjustments. We offer a professional full-service repair facility. Adjustments and minor repairs will be done free-of-charge for our rental customers. For your convenience, we offer two ways to pay for your rental instrument. Automatic debit to checking account. Automatic credit card or debit card billing. Beacock Music also offers instruction for musicians of all ages and ability. New classes are always starting for all instruments. For a complete schedule of upcoming classes call the Education Center at 360-694-7134. Monthly tuition is $120.00 per month for half-hour lessons and $240.00 per month for one-hour lessons, with students taking lessons once a week. There is also a life-time registration fee of $25. *Please note the monthly rate is the same, regardless of the number of weeks in the month. The road program has been great for our band program. Phil has always been extremely reliable, and incredibly flexible. I know that when he says he is on something, that it always gets done, and done right.